A place where learning to ski is a real blast for the kids! They’ll even get to ride through a tunnel and down a moguls run. At the top of the funslope they get to high-five a big orange hand, then away they hurtle through all the fun obstacles. Once at the bottom, a platter lift carries the kids quickly and safely back to the top to begin their next exciting adventure without delay. 1 ride on the Grossarltal Panorama Lift and 1-day use of the platter lift incl. funslope costs € 28.50 per adult and € 17.00 per child. Welcome to the Funslope Großarltal, the big highlight for the little ones at the ski resort Großarltal-Dorfgastein. 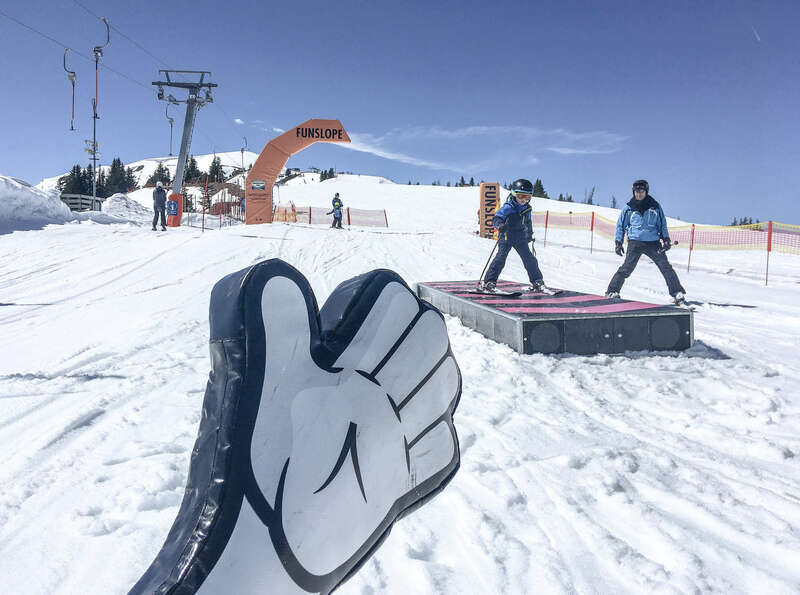 The funny sound effects, the life-size figures that are waiting for numerous high fives and many more varied snow obstacles will put a smile on the faces of the whole family. Come on over and experience an unforgettable snow adventure! The skiing resort Großarltal-Dorfgastein offers slope fun for the whole family. Whether you are a fan of the normal pistes or an adventurer seeking some variety – here, every winter sportsman finds his personal playground. The Snowpark Großarltal is perfect for those skiers and snowboarders who are willing to take some risks, while the Funslope Großarltal holds some big portion of fun for everyone – no matter whether absolute beginner or advanced pro. If you can’t decide which one to choose – no problem! The two areas of the Fun Area Großarltal are only a jump away from each other. Clip on your skiers or snowboard, crouch down and slide into the Funslope Großarltal! First you ride up and down over the funny Wave Run and then, bada boom bada bing, through the tunnel of snow. As soon as you see daylight again, don’t forget to stretch out your arm and give the big cushioned hand a high five. It will reward you with cool sounds. After that you can slide over a box and you are already jumping in the direction of the finish line. Now you ride over a Wave Run once more and head towards our mascot Slopy who is also waiting for your high five. Before you reach the finish line, you rush over some swift banked curves and then into the goal. Whoever can’t get enough of our Funslope simply takes the T-bar lift “Kreuzhöhe” and starts another fun ride. Enjoy! For more information about the skiing resort Großarltal visit www.grossarltal.info. Here’s to an unforgettable snow adventure in the Funslope Großarltal – we are looking forward to welcoming you!